Toronto would benefit from some Hamilton-style activism. 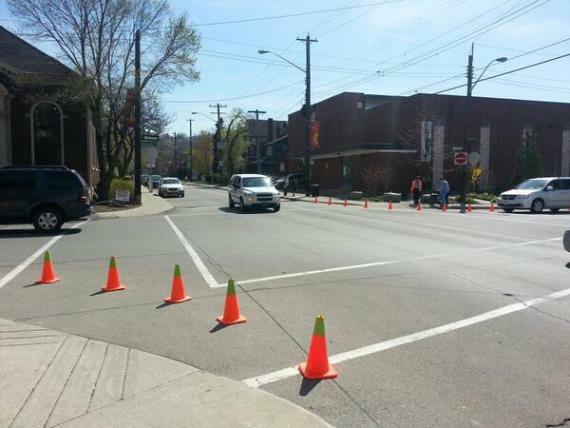 Hamilton activists, frustrated with inaction from the bureaucracy, took it upon themselves last year by installing a bump-out/neckdown with just some cheap traffic cones and screws. Tactical urbanism, it's called: quick and effective urban interventions to make the city more livable and equitable. Where before there was an intersection at which children felt unsafe when crossing to school, now they have a shorter distance to cross. Cars are forced to turn more slowly, which increases the chance of these children surviving if hit and gives the drivers more time to stop. The local crossing guard loved it. Win-win I would say. But the result upset Hamilton's grinch, Public Works General Manager Gerry Davis, who circulated a memo calling the actions "illegal, potentially unsafe and adding to the City's costs of maintenance and repair." Right, if Mr. Davis really cared about safety before why has his city always prioritized car throughput over safety? Luckily other forces in the city among the councillors and staff thought this was a worthy effort and managed to make it an official pilot project. 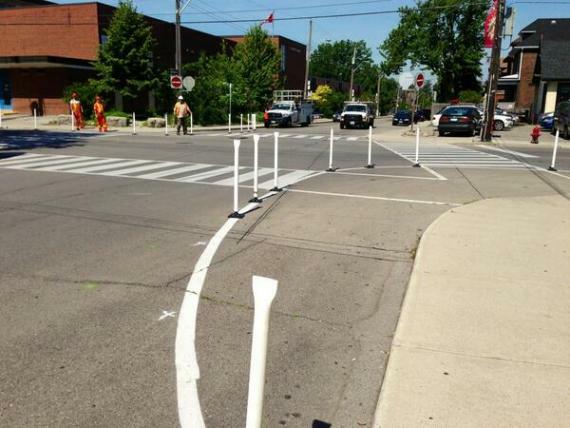 Hamilton has since made the bump outs more permanent and installed cross-walks on a number of similar intersections. I think they could have gone further. 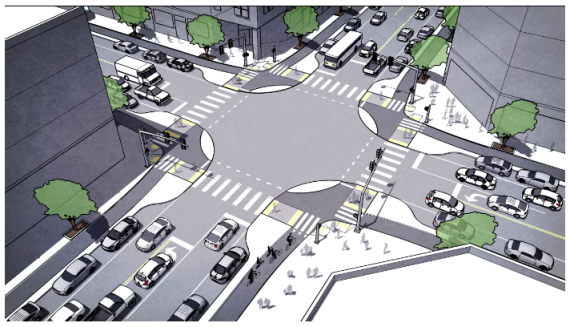 It would be awesome if someone built protected Intersections for cyclists and pedestrians. The bump-outs are islands at the corners which allow for more protection for cyclists when crossing the street while also putting cars further away from pedestrians at the corners. It's a long-shot to make it official policy here; the owner of the website above is trying to get the protected intersection recognized in the US. It'll not happen anytime soon here. But one can hope and perhaps some guerrilla protected intersections would encourage city officials to be braver. So the curb lane of each road leading to this interection - they are all parking spaces? Or are the cars funnelling from two lanes to one before the intersection? In this example it seems so, but I don't think it's a requirement for it to work. Look at this video of how it works in Netherlands: https://www.youtube.com/watch?v=FlApbxLz6pA or on the protected intersections site and see examples from other cities. In the Dutch case it's a two way street with protected bike lanes and no car parking. A great deal of the Public Works or Roads departments' employees or management or boards have the point-of-view of motorists as top priority. Not bicyclists. Not pedestrians.